I’ve been putting off as long as I dare the process of buying a new smartphone. Call me cheap (I prefer frugal! ), but I don’t like turning loose of my money or having to get used to something new when I’ve been able to operate mine practically blind-folded for years. My poor phone regularly loses its charge, so I’ve been babying it to conserve battery life. Meaning I haven’t taken as many pictures as I normally would. Still, I’d like to think some of you, at least, might have missed seeing signs of spring in Illinois. 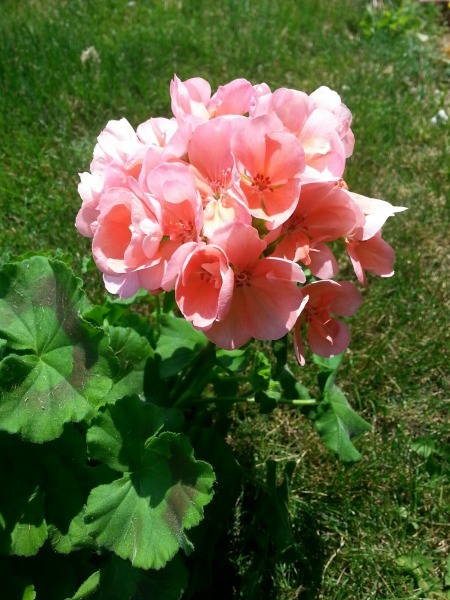 Who can resist a pink geranium? 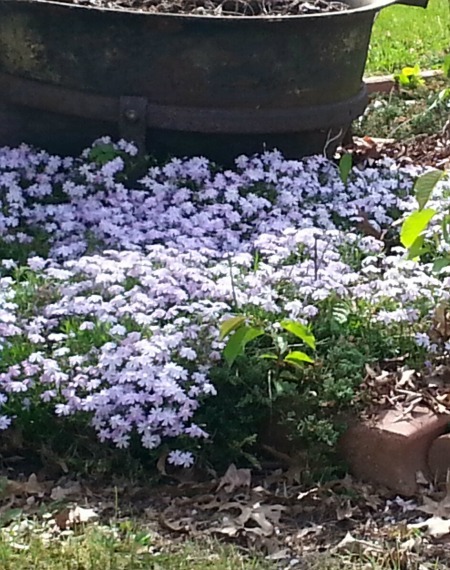 Might this be a variety of phlox? 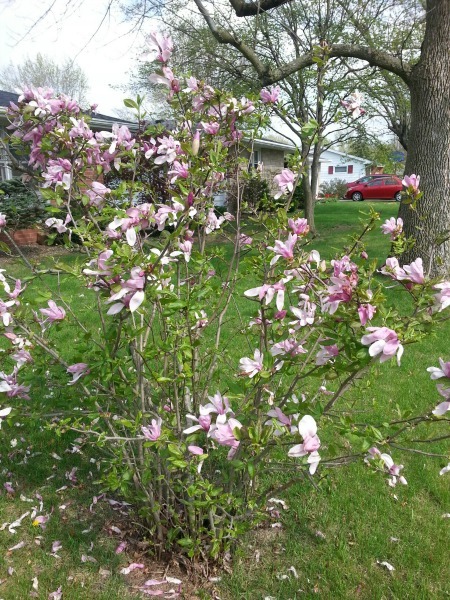 This entry was posted in Seasonal and tagged dogwood, flowers, geranium, phlox, rose, spring. Bookmark the permalink. My mother had some of those peace roses. They were among my favorites, for sure. I think the shrub right above it is white lilac. 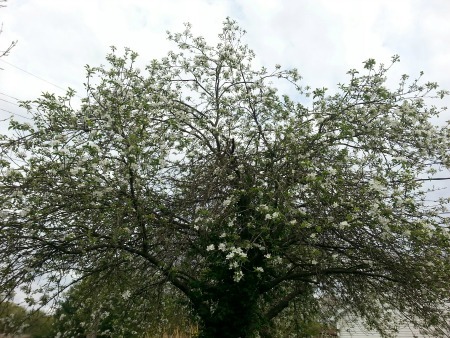 One thing that always balanced the sadness of seeing the blossoms fall from the trees was the experience of seeing them fall all at once, sometimes. It would be like a petal blizzard — just wonderful. As for the phone — can you just get a new battery for it? That’s what I did for mine, and it perked right up. We have a store here called Batteries and Bulbs that sells all the weird batteries that you never find in the stores. I found out about it from the Verizon store. They don’t stock the batteries for my phone any more, because it’s such an old model, but Batteries and Bulbs had it. 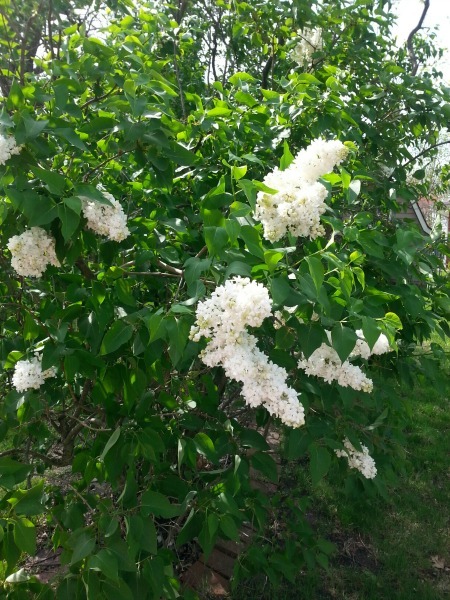 I think you’re right about the white lilac, but it just seems like a misnomer. “Lilac” is supposed to be purple! As for the peace rose, I think we’ve always had one. There’s something so calming about seeing the pink and yellow intertwined that way. A “petal blizzard” is a great way of expressing it! I’ve got a photo of Dallas lying in a carpet of pink magnolia petals from one of our walks, and I just love it. I should have thought of a new battery a LONG time ago. The thing is so old that I wonder if a new battery wouldn’t just shock it to death, ha! 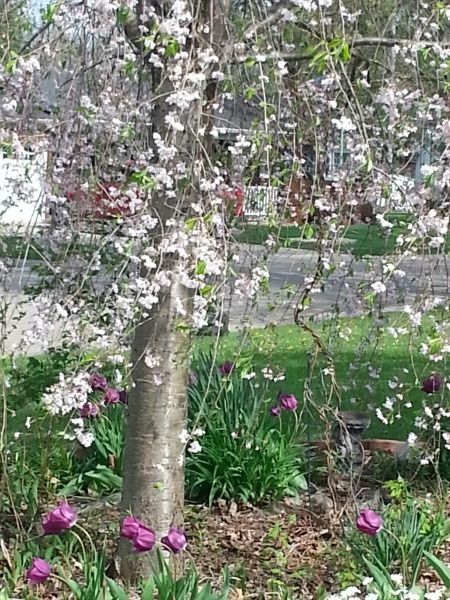 Debbie, your smartphone takes awesome photographs, these are BEAUTIFUL! 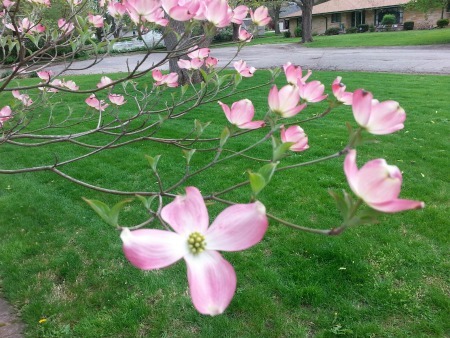 The pink dogwood is gorgeous, as well as the pink geranium. Glorious color! And you’re right about the peace rose – stunning beauty! 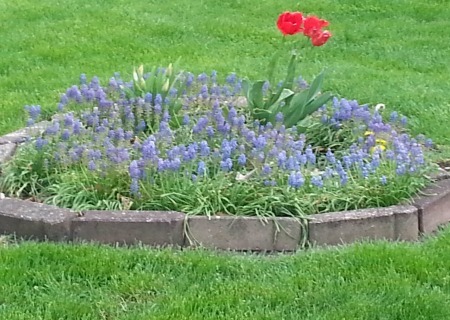 Don’t you just love Spring and how just looking at flowers puts a smile on your face? I agree with you about getting a new phone because I’m frugal as well. I know some people who get new phones every year, and these are expensive phones I’m talking about. I just don’t get it?!? Have a fabulous Monday and week, my friend! Oh, Ron, I’m glad to learn that Domer and I aren’t the only “cheap” phone buyers! His phone is the same age mine is, but he’s not having near the trouble I am (and he’s on it ALL day long!) I know I’m going to have to bite the bullet soon — and part of me is looking forward to not having to be plugged into an outlet just to talk! — but I’m not eager to part with the money. Maybe if I wait long enough I can get a deal, ha! I’m glad my spring photos made you smile, my friend. They sure did for me. I, too, love blue flowers — hydrangeas, hyacinths, and so forth. The purple ones also are extra-special. And the reds, pinks, yellows — aw, gee, I just love ALL the colors of Spring! My dad was my go-to expert on all things flower and tree, but he’s no longer here to help me. Google, sadly, is a poor second choice! Super photos, Debbie. Knowing what they are is secondary to their beauty. 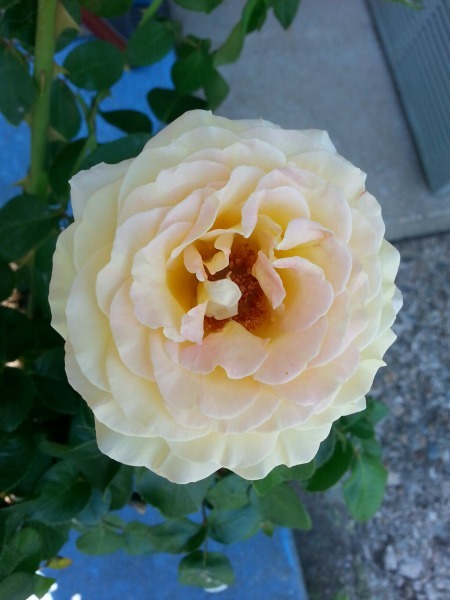 You’re right — “A rose by any other name …” Glad you enjoyed them, John! Aw, thanks, Cindy. They can’t compare with the photos you take, but they prove (if we need proof) that beauty is all around us! Flowers are such a gift of nature! Thank you for sharing these. Now that I’ve moved to the desert in Arizona, from the lush green of Oregon – it’s such a special treat to see delicate blossoms. The desert has a beauty all its own, Barb. Very different, I imagine, from lush Oregon, but beautiful nevertheless. I’m glad you enjoyed seeing part of Illinois as much as I enjoyed sharing it! Oooooh…so beautiful! Thank you for your annual spring pictures. Tanya, I’m glad you enjoyed them. I’ve missed you lately and pray everything is good in your world. I know you hadn’t been blogging as much and hope that’s a decision you’ve made rather than one foisted upon you. Blessings upon you and yours! Good for you! I just keep putting it off, knowing that my old phone is limping along, barely usable. One day I’ll man up and do it, ha! Yes, I just have to look past the aggravation and enjoy the learning process! Sounds lovely, Kim, but I think I might miss the first snowfall of the season, ha!